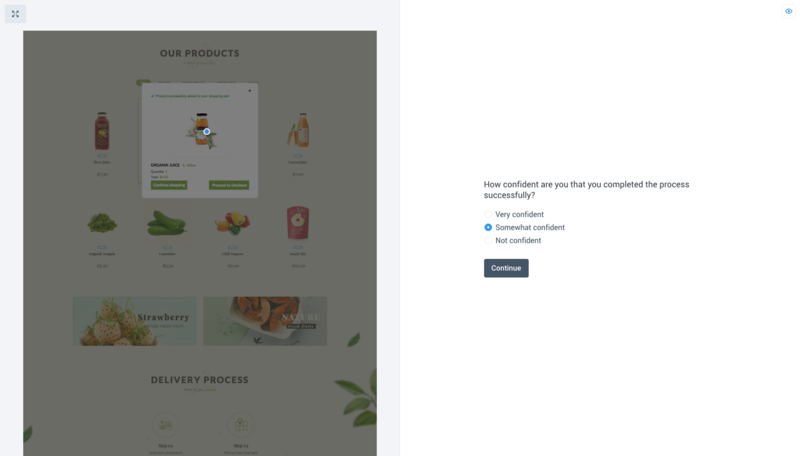 In this test, we measured if participants can navigate through an e-commerce checkout flow easily. This type of navigation test is great for identifying bottlenecks and steps that cause confusion, resulting in lost sales and irate customers. It’s also good for validating drop-off metrics from your on-site analytics package. Did users click somewhere unexpected? Was there a particular element that misled them? Was the target element easy to overlook? Are there unnecessary elements on the page distracting users from the target? Asking follow-up questions can help you answer some of these questions, and understand the behavior of users who didn’t click where you expected. It’s also informative to look at how long it takes participants to complete each step, but don’t obsess over this data before you’ve got at least two tests of the same flow done. This enables you to compare the performance of different design variations and pick the best solution.